More car news this week for you all, including the new Porsche Panamera, the first look at the McLaren 570GT and a refreshed Aston Martin V12 Vantage S. Woohoo! The more practical Grand Tourer supercar is marketed as the most usable and luxurious McLaren ever. The car started life as a 570S Coupe but after a number of changes we now the latest addition to the brand's Sports Series range. The GT boasts more boot space than any of their models, an impressive 220 litres compared to the 150 in the 570S. In comparison, that's more than a Ford Focus hatchback currently offers - so plenty of room for the shopping! Other small changes include a P1-like convex glass rear end, a unique rear spoiler which is 10mm taller than any of the other models, and softer damper settings to make the car more usable day-to-day. Inside you'll find full leather upholstery, electric heated seats and soft-close doors. It's powered by the same 562 bhp 3.8-litre twin-turbo V8 and is available from £154,000 with the first arriving later this year. Porsche's latest Panamera has been spotted out and about and reveal the car in nearly all it's glory. Usually a spied car is somewhat hidden under a camouflage paint job or deceptive body panels however these Panamera shots show almost all the car with only the lights covered. You'll notice it has a long bonnet and lower roofline than the current model, giving more of a natural four-door coupe look than before. At the rear they seem to have adopted a wider look similar to that of its 911 brother. No exact details are known about the car's specifications but turbocharged engines can be expected, ranging from a 258 bhp 3.0 turbo V6 diesel to the monstrous 562 bhp bi-turbo V8. Its official unveiling will occur later this year, and we'll have all details then on what's powering the Mercedes CLS rival and also see how the car will look with its new lights. It's been announced that the V12 Vantage S has received a small revamp which includes a manual gearbox for the first time. Aston Martin say the changes form part of a constant ongoing desire to keep the car as up-to-date as possible, with the manual gearbox being offered to satisfy the performance car purists in their customer base. Further additions include an array of exterior and interior adjustments including a necessary upgrade to their infotainment system. Alongside the updates comes a new optional Sport Plus Pack which adds an accented grille, wing mirrors and side sills available in five different colours. You also get bespoke graphite alloys and a choice of either black or grey upholstery inside. All of the updated models go on sale in autumn and will cost upwards of £140,000. Audi have announced that a facelited A3 is arriving, bringing a sleeker new look and more technology than ever before. As with any facelift exterior changes are inevitable, and with the latest A3 you'll find a wider grille, narrower headlights and a wider-looking back all give the car a sleeker, more pinched look. Underneath the hood brings two new engines too - an entry-level 1.0-litre three-cylinder turbo delivering a respectable 114 bhp, and a 2.0-litre four-cylinder turbo pushing 188 bhp. Other changes include a new seven-speed gearbox replacing the old six-speed, plus several optional extras as part of Audi's new developed technologies including an improved lane-assist system, pre-safe braking system, autonomous braking system, and their latest Virtual Cockpit set-up. The facelift A3 goes on sale in May with prices starting at £18,000 for the new 1.0-litre model. 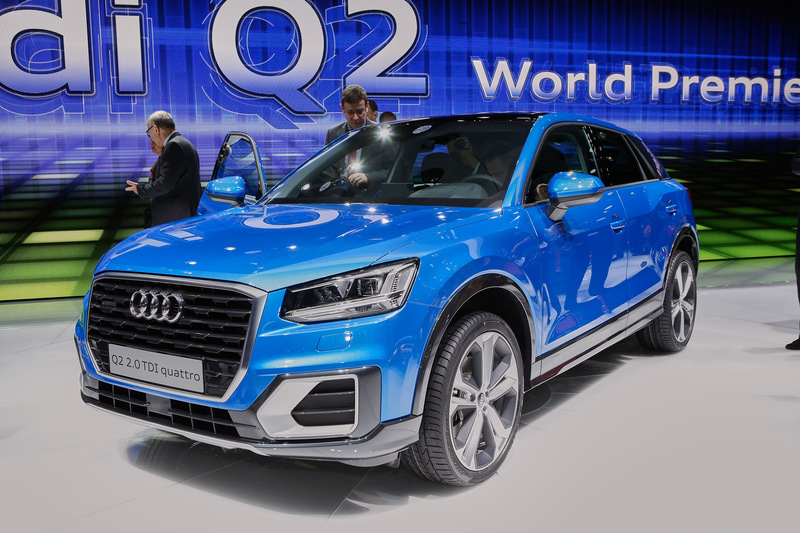 More Audi news for you and it's regarding the arrival of the brand's newest addition to the crossover family - the Q2. The SUV is the fourth member of the Q family and also the smallest, taking influence from the Crosslane Coupe concept that was displayed back in 2012 at the Paris Motor Show. Although the concept started as a two-door, it has developed into a five-door which Audi say is designed to get customers used to buying their cars. Twelve colour schemes will be offered on launch as well as several options for customisation, including painted bumpers and blades, various alloys ranging from 16 to 19-inch, and multiple interior adjustments such as a two-tone roof and coloured dash inserts. There's also the usual line-up of engines including two petrols and two diesels, and there's even potential 'S' and 'RS' equivalents in the pipeline too! Prices start at £22,000 with the first orders being taken from July ahead of its November launch.